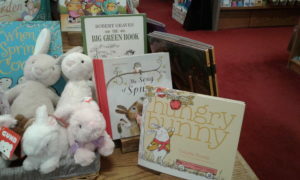 The Song of Spring sat behind Hungry Bunny in the Spring/Easter display and since I did not want to head back to work right away, I took a minute with it. Hendrik Jonas’s book has a little interaction to it, which I thought tied it in nicely with Claudia Rueda’s book. This interaction of saying the sounds of the animals you encounter is a bit more traditional than the actual moving of the other book. But you still will be having the child listener partake in the story as well. Hendrik Jonas does have some fun artwork. There are a lot of colors and details. They are engaging and move the story along. They are realistic with a bit of fanciful to them. If anything, they are stronger than the actual text. I could see them on stationary or even prints for a nursery. We pay for our website first, and then all proceeds above and beyond those fees are donated to the American Cancer Society in AlabamaPink's name. Find out how else you can help support our mission. Share the post "As the illustrations grow crowded friendship grows too"
Get your Wild Kratts here! J on “I wasn’t ashamed of anything because our family secret wasn’t dark and my mother acted neither apologetic nor embarrassed.”Such a good book! The affection comes through on every page. emmalita on What a Bunch of A-holesYou should definitely listen to those podcast episodes. All your rage will be for the assholes involved. badkittyuno on “Carnivore in the streets, person-who-has-eaten-a-carrot-masquerading-as-a-hot-dog in the sheets.”Ha I didn't even realize. Thanks!